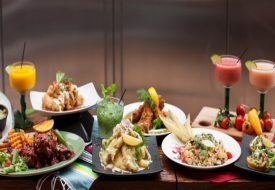 Millionaires in Singapore–A success story? By now you’ve probably heard that Thai Smile Airways is now allowing passengers to purchase a seat for their Luk Thep − or supernatural child angel doll. Luk Thep owners ‘feed’ and spoil their dolls with expensive clothing, believing their dolls bless them with luck and wealth. However, not all dolls are as benevolent. 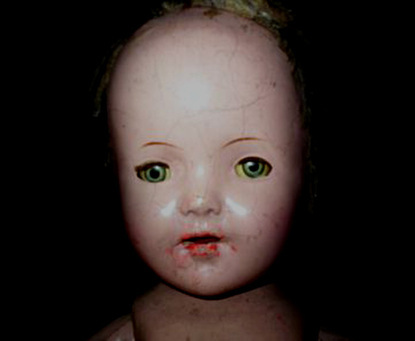 Here is a list of 12 of the most haunted or evil dolls in the world and the stories behind them. If you happen to sit next to one of these dolls, I suggest you quickly grab your carry-on luggage and leave the plane immediately! The inspiration behind Chucky from the Child’s Play series of horror films, Robert was given to artist Robert Eugene Otto in 1906 by a troubled servant of the family who dabbled in black magic. Neighbours of the Otto family have seen Robert running amok in the house. The Otto family would also wake up to the sound of young Gene Otto’s screams. His bedroom would be in disarray and his only explanation would be “Robert did it”. Robert is currently housed in the East Martello Museum in Key West, Florida. It is said that he curses naysayers and anyone who takes his picture without permission. The museum also displays visitors’ letters written to Robert, begging him to undo the hex he had placed on them. This one is not as scary; albeit the only one that isn’t. In 2007, a man from Pulau Ubin had the same dream three nights in a row. In his dream, a little Caucasian girl led him to a toy store to buy a Barbie doll. After the third night, the man went to a toy store and lo and behold, he found the exact Barbie doll he had seen in his dreams. Believing it was the spirit of the German girl who died on Pulau Ubin 117 years ago who entered his dreams, the man placed the doll at an old temple that houses her hair and crucifix. The Barbie doll is said to have supernatural powers and the spirit of the German girl continues to haunt Pulau Ubin to this day. Fans of The Conjuring, the frightening film inspired by real life events, would know the infamous Annabelle. 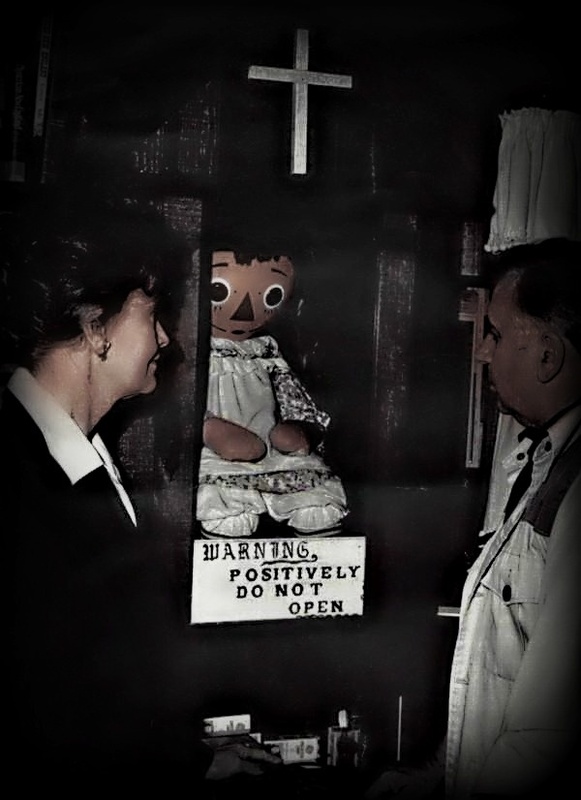 Annabelle was actually a rag doll given to a young lady named Donna in the 1970s by her mother, while she was in college. Donna and her roommate would find that the doll had moved on its own, even appearing in different rooms although no one had touched it. 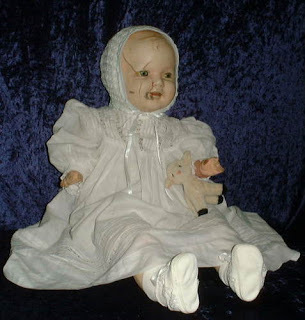 With the help of a psychic medium, the girls conducted a séance and found out that the doll was possessed by the spirit of a young girl who had died where they were staying. Taking pity on Annabelle’s story, the girls allowed the spirit to stay, which resulted in the hauntings getting worse. Annabelle eventually attacked one of the girls’ friends by viciously scratching him across his chest. Renowned paranormal investigators and demonologists Ed and Lorraine Warren were called in, and took Annabelle. ‘She’ is now displayed in the Warrens’ “Museum of the Occult”. Four different voices, one baby doll. Joliet has been passed down for more than four generations from mother to daughter. Each woman is cursed to have a son and a daughter, only to have the son die three days after birth. The son’s soul is then transferred to the doll. Every night, Joliet lets out piercing screams of the different male babies, sometimes individually, sometimes in unison. I don’t know about you, but my skin is crawling already. 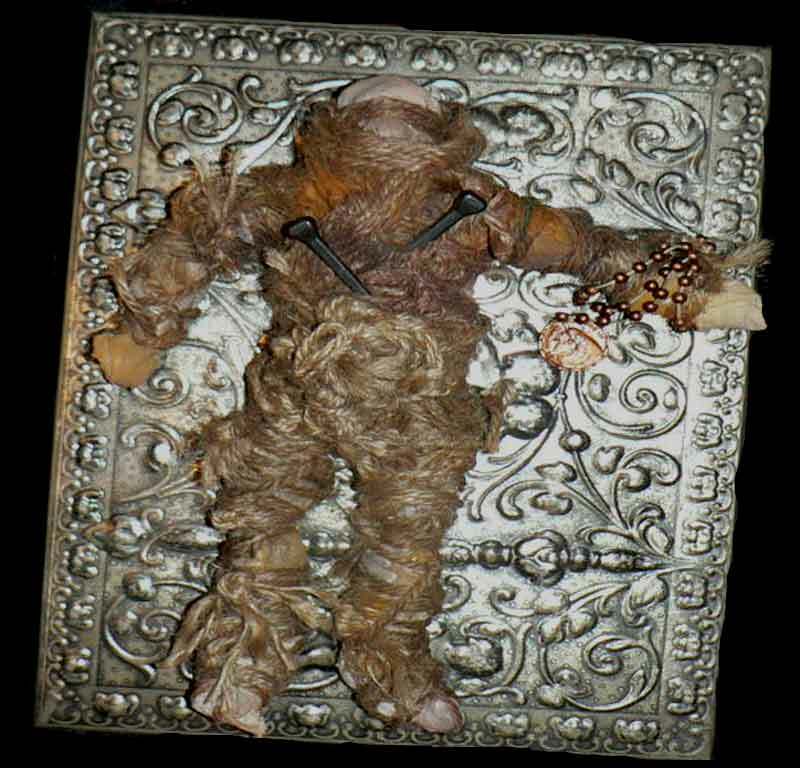 In 2004, a woman from Galveston, Texas bought a Zombie Voodoo doll from New Orleans off eBay. Instead of listening to the seller’s instructions to leave the doll in its silver box, the woman took it out and put the doll on display. Since then, the doll has been attacking her and haunting her in her dreams. She attempted to destroy the doll by burning it in a fire but it would not burn. Her attempts to cut it up or bury it were also futile. Finally, she tried to resell the doll on eBay but it would always reappear at her doorstep after a period of time. Legend has it that in the 1800s, Marie Laveau, the notorious Queen of Voodoo, placed a curse on a young bride who had jilted her ex-lover. The girl gave birth to a grotesque baby and lost her own life in the pregnancy. The Devil Baby would attack anyone who came across it so, to protect themselves, the townsfolk carved gourds to resemble the devil baby to scare it off. New versions of these dolls were sold in New Orleans in the early 20th century. 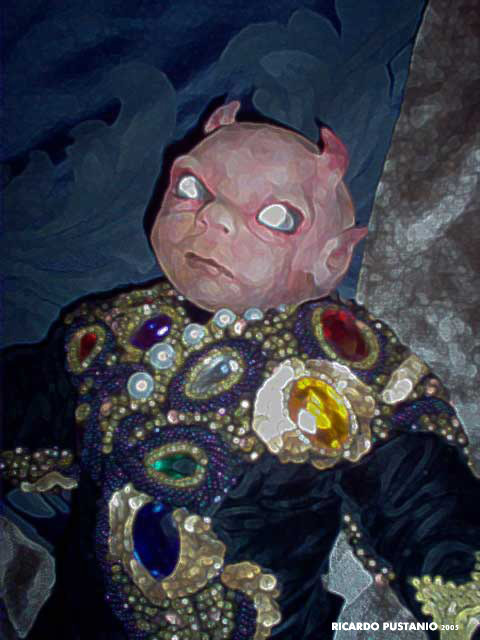 Their owners report that the spirit of the devil baby continues to live in these dolls. 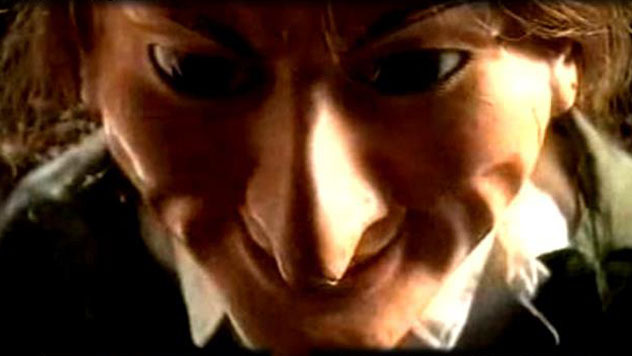 The dolls’ eyes follow their owners across the room. Others claim that the dolls speak and move around on their own. Yikes! While not known to be malevolent, this might be one of the creepiest dolls. Eikichi Suzuki bought this doll for his little sister in 1918. A year later, Eikichi’s sister died and the family named her favourite doll after her. Soon, they started noticing that the doll’s cropped hair was growing. They brought samples to a lab that confirmed that the hair was human. Today, Okiku is on display in the Mannenji temple in the town of Iwamizawa, Hokkaido. Every year, the doll’s hair is allowed to grow until it reaches knee length before it is trimmed back to shoulder length. Its hair has been growing for the past 75 years, and this has made the shrine a popular tourist destination. 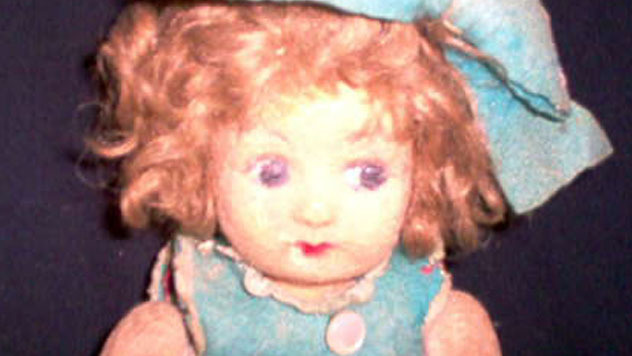 Before donating it to the Quesnel Museum in British Columbia, Mandy’s owner claimed that this antique porcelain doll would cry out loudly every night from her basement. While the crying stopped, Mandy continued to mystify museum staff by hiding pens, books and pictures. 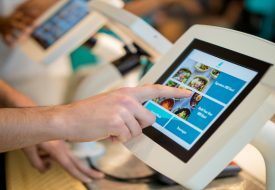 Some staff members claimed to have heard the sound of footsteps pattering even when no one was around. Visitors to the museum say that Mandy’s eyes blink and follow them when they walk. They also find it difficult to photograph her as she likes to mess with camera equipment. Modelled after her Italian owner, Pupa even sports locks of her owner’s real hair. 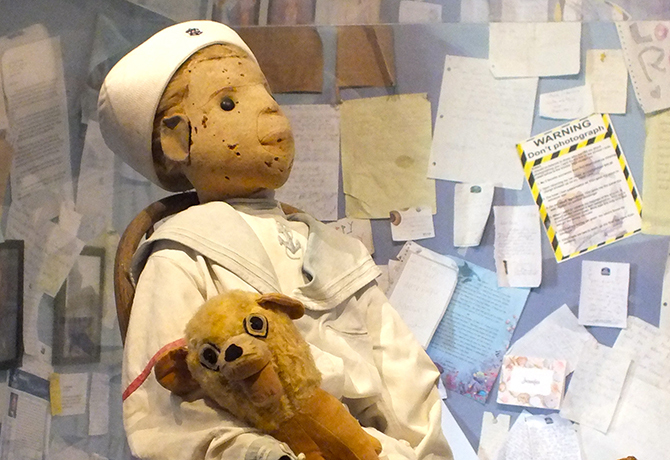 Pupa’s owner claimed that the doll would speak to her and that the two were best friends. When the owner died in 2005, her family put Pupa in a glass case. However, they said that Pupa would periodically change expressions and positions, and has even escaped from the case on occasion. Pupa also taps on the glass to remind people to let her out of her case. Let’s face it, marionette dolls have always been creepy. But the one found by Kerry Walton in an old abandoned building has to be the spookiest of them all. People believe that the doll was made by a Roman Gypsy over 200 years ago for his son. When his son died, his soul lived on in Letta. Letta moves on his own, changes positions and even emits an eerie pulse when held. Whenever the doll is taken outdoors, it starts to rain. Pictures also slide off the wall whenever Letta enters a room. Once discovered resting beneath a tree with its eyes blindfolded, this creepy doll in a lace dress has since gone missing. 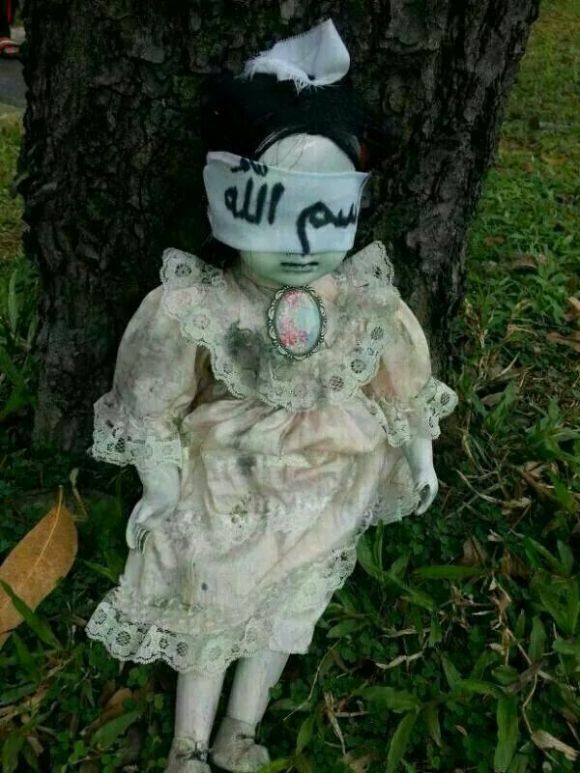 The cloth covering the doll’s eyes had the word “Bismillah” — an Arabic phrase meaning “in the name of Allah” — written on it. This was to prevent the doll from finding its way back to its owner. 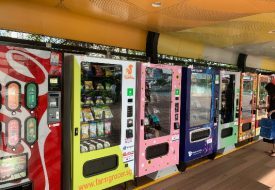 We wonder where the Hougang doll could be now. Is it still roaming the streets hunting for its owner or has it found its way home (new or old)? Even though this isn’t exactly a haunted doll, the doll in this painting is seen holding up a gun to a little boy in this piece titled “The Hands Resist Him” and causes him unrest. The doll and the little boy are said to move around at night and sometimes disappear from the canvas altogether. 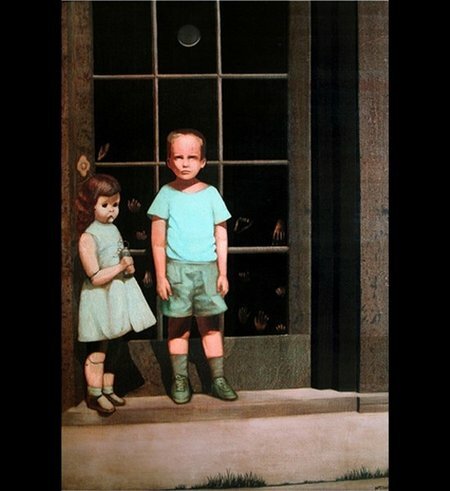 Owners of the painting have also stated that the boy and the doll would leave the painting and enter physically enter the room. Additionally, the three men most closely associated with the painting including the gallery owner who first contracted it and the patron who first purchased it all died within the first few years of the painting’s completion. The next time you’re on a plane and the baby next to you starts kicking up a fuss, be grateful that it isn’t one of these frightful characters here.